This Irish gift for himself is also ideal for herself too. This Irish pocket knife features stainless steel construction that is enhanced with a Celtic knot-work motif on one side of the knife. The Celtic pocket knife is complete with a sharp blade and file along with two additional tools and a key ring loop. The closed knife measures 1 3/4" long, not including the key ring. 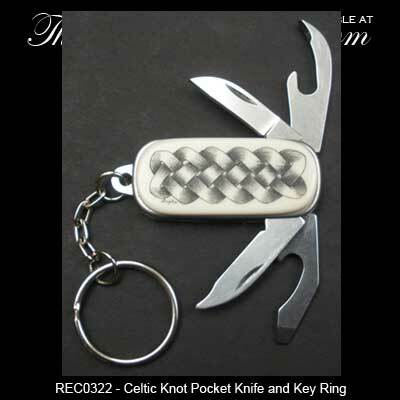 The combination knife and key ring is gift boxed with a Celtic knot history card, complements of The Irish Gift House.